I would encourage anyone thinking of travelling to Africa to call Southern Sky Adventures. Richard Pace was recommended to us by several of our friends in New York. Specializing in tailoring trips to fit your objectives, Southern Sky Adventures can, of course, can recommend destinations and “must see” areas of interest. The great thing about Richard is that he can mix and match all sorts of accommodations and activities to meet almost any budget. He put our entire trip together including flights, hotels, dinner reservations, wine tours, white shark dives, etc. 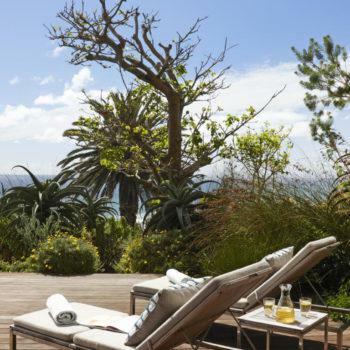 He knows where to stay and makes sure that your rooms are the best – facing the ocean or vineyards. He knows fantastic restaurants big and small tucked away and on main thoroughfares. Also, he’s accessible even while you are in country – we called him several times to ask for recommendations. As I mentioned, our bags didn’t make the connection through London to Johannesburg. Obviously on our honeymoon we were quite concerned. What’s more we were going immediately by plane from Johannesburg to a remote area in the bush. We called Richard in a panic, and he told us not to worry that he’d handle the whole thing. Sure enough – he managed to get our bags out to us in the middle of nowhere. Also, whenever we checked into hotels we ended up w/ the best suites or accommodations. In Plettenberg Bay we had the top honeymoon suite overlooking the ocean (and I can assure you that I didn’t pay for it). In Cape Town, we “somehow” got the VIP suite overlooking the beach – this was a suite w/ an entirely separate dining room (who eats in a dining room on vacation??). Again I didn’t pay for this upgrade. Richard can also arrange for guides to pick you up and shuttle you around in the country if you are concerned about getting lost or simply safety. Although we didn’t take him up on the offer, a group of girls from NY selected this option and the guide stayed w/ them for most of their trip – driving them to lunches, dinners, and day excursions. If you are going to South Africa – you must call him before you go!